Coupon must be presented at vehicle drop off. One coupon per vehicle. Not combined with any other offer or discount. When your car lurches or makes a scary noise, you can trust the professionals at AAMCO of Charlotte to provide expert transmission repairs in downtown Charlotte. We hire only the most skilled transmission rebuild and repair technicians. Our technicians are trained to use the most recent technologies to diagnose and repair your transmission. From there, we are well situated to perform whatever repairs need to be done to your vehicle. You rely on your car to get to work, ferry your children from school to soccer practice, and get to social engagements. We’re proud to offer a comprehensive diagnostic scan of your transmission. The scan checks your transmission fluid, as well as all of its internal and external parts. That’s why we understand that having your car repaired is a stressful event. We strive to provide a calming and welcoming environment in our waiting room while we repair your vehicle. We believe in providing honest service. We don’t upsell our customers for services they don’t need. If you need transmission repairs, we will not try to sell you a new spark plug. Our reputation is built on our forthright service and is backed up by the testimonials and experiences of our customers. We’ve built our reputation for being the transmission rebuild and repair experts Charlotte trusts. If your vehicle’s making unusual noises or your check engine has come on, we’d be happy to take a look at it for you with a free multi-point vehicle inspection. AAMCO of Charlotte strives to take some of the stress out of auto and brake repairs in the Charlotte area. Be sure to ask about our special discounts and financing options (upon credit approval). Contact us today to schedule an appointment! Nationwide Warranties – As part of the large AAMCO family, our auto repairs are backed by nationwide warranties that are among the best in the industry. State-of-the-Art Diagnostics – If your check engine light has come on, you can count on our complete electronic and external diagnostics to pinpoint the issue. Scheduled Maintenance – Don’t visit your local car dealership for factory-recommended maintenance and auto repairs; come to us instead! Free Towing – If you need any major transmission or auto repairs, we offer free towing. 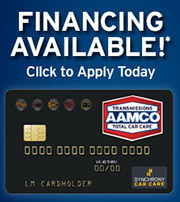 Transmission Experts – The AAMCO brand is nationally recognized as transmission, brake, and auto repair experts. Fleet Service Contracts – If you’re a local business with a fleet of vehicles, we can help you keep your fleet running efficiently. Our local fleet service contracts are comparable to national fleets. I went to AAMCO Transmissions for the very first time, recently, to have the transmissions rebuilt in two of my vehicles. I've never had such problems, before, so I've never needed to look for this company, before, but I'm very very glad to have found them, when I needed them, this time. They were excellent! They have very clear communication and kept me well up-to-date on the status of the work, as they were doing it. They were also very thorough in explaining problems, and very pleasant, overall. I would definitely recommend them to others. AAMCO Transmissions are very courteous. They rebuilt my transmission and had it completed exactly as they said. It seemed to me that they had it in and out very quickly. My car is running great and I am very satisfied with their service. I took my vehicle to AAMCO Transmissions for the first time trying them. I walked in with no appointment and dropped it off. They had to service the transmission and do a complete oil change. They had all the work done the very same day. It was a good experience. The crew seemed knowledgeable and very friendly. I would highly recommend AAMCO Transmissions. No complaints at all. I called AAMCO Transmissions to set up an appointment and they told me I could bring my car right in. Everyone was very polite and respectful. The clerk was very accommodating of the amount of time I had to get the repairs made. They were very easy to work with. The technicians worked hard to get it done on time. They completed replacing the brakes and doing an oil change for me. Everything turned out great! I would definitely recommend them. AAMCO Transmissions replaced my transfer case. It was my first time and I actually went there because I broke down next to the shop, but I found that they were really friendly and kind. The service was attentive and they answered all my questions. They did a great job and the price was reasonable. I would go back again. I had some serious transmission issues and the folks at AAMCO Transmissions were able to repair them. I've used their service a few times and been very satisfied overall. They have professional and friendly employees and they're pretty knowledgeable about what they're doing. The check-engine light in my vehicle had come on, so I went to AAMCO of Charlotte and they ran a computer test that said there was a problem with the transmission. I was from out of state and needed to get home over the weekend. So, they checked my car and transmission and determined with their expertise that they knew I could get home. And I did. I then had the car re-checked up here at another AAMCO that found absolutely nothing wrong with it. I have an older car and this was my first experience with AAMCO Transmissions. From my first call to them they had excellent repore with me over the phone. They answered all my questions and they had a caring manner. They were very honest and open about the repairs and the cost of the repairs. For the age of the car and the extent of the work that I needed I just decided not to have it fixed at this time. But if I do decide to have the repairs done in the future I will be contacting them. Very nice people! AAMCO Transmissions did a very good job for me. They replaced the transmission on my car and I'm very happy with how it's turned out. They made good on what they promised. Their pricing was reasonable. Their technicians know what they were doing and the work was done well. I would go to them again if I ever needed to. The folks at AAMCO Transmissions were super friendly and super fast. I don't recall the specifics of the parts they were working on, but they fixed my car and had the job done in less than 24 hours. The pricing was reasonable and I would go back again, though this was my first time. I would recommend them to others too. © 2019 AAMCO of Charlotte. All Rights Reserved.